The second issue of Styled magazine is out today! (Styled is an online magazine and it’s free.) I’m so excited to tell you that I have an Autumn project in it! I made pie dough lattice cookies that are meant to sit on top of a mug of hot apple cider. I cannot wait to see the rest of the issue. And this time it’s also available in print through MagCloud. I took a set of photos showing how to create the lattice that couldn’t fit into the spread so I’m including them here. (Typical, when asked for three photos I send two dozen!) This is something I learned while watching the old Martha Stewart show (memories! ), and you can see it on the Martha Stewart site right here. Also a tip for my cookies: once these are cut it’s easier to remove the dough around them than to try to move them one by one onto a cookie sheet. Instead lift up the parchment they are on and slide it onto your baking sheet, I used a cutting board as a sort of peel. I’m sad to see summer gone, but I’m also looking forward to sweaters and hot cider! Click through to see the complete pie lattice how-to. Roll out two rounds of dough, rolling each between two layers of parchment will make this super easy. Cut into strips. Move the strips apart carefully. Fold back every other slice. Lay down one strip of dough from the other section of dough. Now fold the other strips of down back over the one you just laid down. Put down another strip of dough from the other set. Fold the strips back flat. Continue on like that until you’ve got a full lattice. These look like a lot of fun and I love the idea of using them like stroopwafel. I love this! This would be perfect for after Thanksgiving dinner! Totally smitten by these. Wow. Thanks! Aren’t these just the most precious things ever! 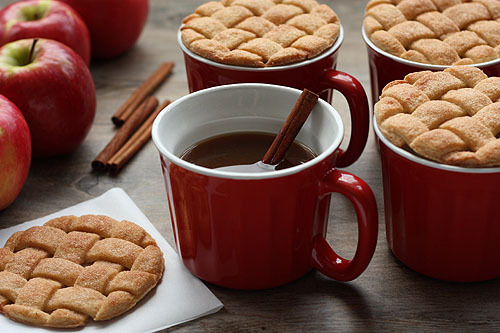 Mmm… a cinnamony cookie and a hot apple cider… Or heck, even better: Hot mulled wine! Thanks for the link to the online magazine; I’m really looking forward to checking it out. These are just the cutest and coziest–they remind me of strupfwafel & I am pondering if there’s a way to incorporate caramel into these…. Wow! It’s like a light bulb just went off – what an easy way to do a lattice crust for a pie. Flip the parchment over and onto your pie wal-lah lattice pie crust that looks great, thank you!! 1. May I please have your brain? It must be an amazing place! 2. These are amazing. My mother will die when she sees them…and subsequently she will be reborn…at which time she will make them and be the envy of all the old ladies in Sun City Grand, Arizona. So fab! Congrats on Styled Mag. I’m trying this tomorrow! I love them! But won’t the bottoms get soggy with cider steam? These are charming! Great pics too. First, thanks for the magazine tip! Oh I’ll have to try this..I wonder if you could do this with a sugar cookie dough instead…Worth experimentation tonight!!! Thanks for the link too. I’ll check that out!! You’ve done it again! These are beyond wonderful. I loved your tutorial. I’ll try with pie dough and cover chicken pies, apple pies and so one. I’ll direct the instructions on the lattice to your site. SO glad you posted this! I saw your tutorial in Styled and wanted to “pin” it to Pinterest SO bad, ha! LOVE this!!! What do you do with the extra pie dough? Reroll it? I just wandered through 12 pages of your previous blog entries looking for something very specific – there was an online craft supplies shop that you had referred to Once Upon A Time… And I canNOT seem to find it! To be more descriptive, they sold lots of different, cool, small parts for various projects (could be as technical as arduino boards, led lights) to general craftiness (wood paneling contact paper and various shades/sizes of pompom puffs). They look amazing! It would be cool to add food dye to the dough, maybe make all the horizontal strips one colour and the vertical strips another colour. Black and orange cookies for Halloween wuld be cool. Yes! Perfect idea for a cozy chat and snack with the girls! I love this! Ingenious! My husband loves pie crust and cookies… he will love this. This would go great with vanilla ice cream topped with apple pie filling. Those are SO cute! My father would have loved those cookies. We used to just take the excess dough, roll it out, sprinkle with cinnamon and sugar, and cut it with a crinkle cutter (wavy edged rolling cutter thingie) . My father loved those. Thanks for the wonder idea and especially how to achieve stunning results! May have to try that soon! I can’t wait to try this!! They look so cute! Es una maravillosa idea. I like it!!! I was wondering what cookie recipe did you use to make those? Marja – Oh, please invite us to the Stuck in Seattle Christmas celebration, we usually stay in town since Cleveland is often snowed in! Thanks again everybody! I had fun making these and I’m glad they are appealing! Megan, your cookies look so perfect and inviting. I just love the idea of serving them on top of a mug. What a great idea for the fall. This is gorgeous and also seems like it takes some time – I wish someone would make these for me! How cute!!! Love the idea! I really want to make these, but somehow my dough breaks everytime I want to either move or fold the strips. Can anyone help me with a good dough recipe??? It would be very appreciated! wow…i´m enthusiastic, but i don´t know which recipe the right for it (sorry my english is not perfect, but i hope you understand me;o) )…i want to try it for some gifts. Could you help me, please? i translate your recipe in german by myself. Mix the flour, sugar, salt and cinnamon. Then add the butter and cut it in to small pieces with two knifes. Add 3-4 spoons of water and knead the dough with your hands into a consistent ball of dough. Leave in the refrigerator for one hour and it’s ready to make cookies! If the dough get’s too warm it will break easily, so when the strips break when you move them, just put the entire plate in the refrigerator for 5 minutes and the dough will be easier to work with. These cookies are impossible. They look great but I’m lucky to make an asterisk. Has anyone successfully made this design? Katrina – The cookies in the photos are cut with the largest of the Ateco set of cutters, so they are 3 and 5/8ths of a inch. I cut each strip just over 1/2″ wide. They take a little care but I promise they are doable! Those little cookies are just about the cutest things ever! Made my day! Thank you! I made these for my daughter’s 1st “cutie-pie” themed birthday! They were a hit- and so easy & fast to make! i am so in love with this…. very adorable ! I found the magazine doing a google search. This recipe uses an actual pie crust(no recipe), brush with egg white & sprinkle with cinnamon & sugar. Bake 400 @10 min. I love these covers, they would be great for Christmas time as mug toppers for any drinks.